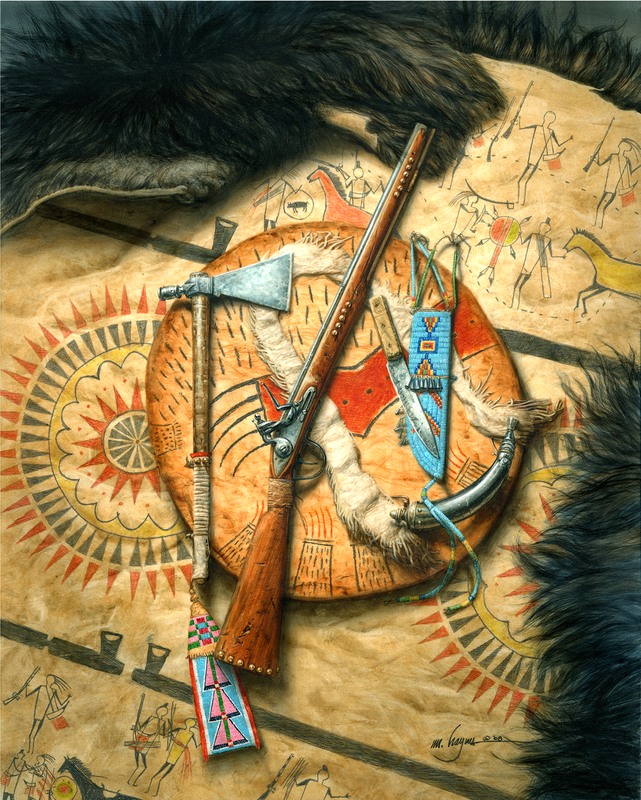 The centerpiece of this painting is the Northwest Trade Gun, perhaps the most widely distributed gun among the plains Indians. These were distributed by the Hudson Bay Company, American Fur Company, the Mackinaw Company and others from the 1770's into the 1860's in exchange for furs. This well-worn example has been shortened for ease of use and large brass tacks applied as decoration. At some point the wrist of the stock has broken and been repaired with rawhide. The knife is resting on its sheath, which is beautifully decorated with very desirable blue trade beads and tin tinklers and a powder horn is attached to a fringed deer hide sling. The dangler hanging from the shaft of the pipe tomahawk is typically Crow in design and color choices. Red trade cloth trims the dangler and rawhide grip. The rawhide shield contained great protective powers to its owner. This is suggested by the large red bear paw shielding the smaller bear paws from the missiles at the top of the shield. The buffalo robe is painted with typical Crow designs as well as some of the exploits of its owner. The figures with the shocks of hair standing up are Crow and their enemies are depicted with long or no hair at all. Each set of figures tells a story of a particular encounter with the enemy. An octant is made of ebony wood, brass, ivory and glass and was aninvaluable tool used by Lewis and Clark to measure celestial objects and thus record their location on the earth. The feather laid over the octant is from an immature bald eagle and is decorated with dyed hair, hide and dyed porcupine quills and is taken from a calumet pipe. Calumet pipes were often offered in ceremonies by many of the tribes along the trail to initiate peace and diplomacy with Lewis and Clark. The octant was sometimes brought out by the officers to impress these same tribes. Without the tools and skills Lewis and Clark brought with them, the success of the expedition would have been in question. Without the aid and friendship of the tribes encountered along the way, the expedition would have failed. This painting is of a Kentucky pistol built about 1775- 1780. It was made using a British lock forged by Thomas Ketland and is leaning against a Golden Age style powder horn with an antler-tip primer. These Golden Age powder horns were often heavily carved and scrimshawed with maps, stylized animals or statements significant to the owner. The strap, trimmed with red trade cloth and white seed beads is a pattern commonly created by the woodland Indian tribes. 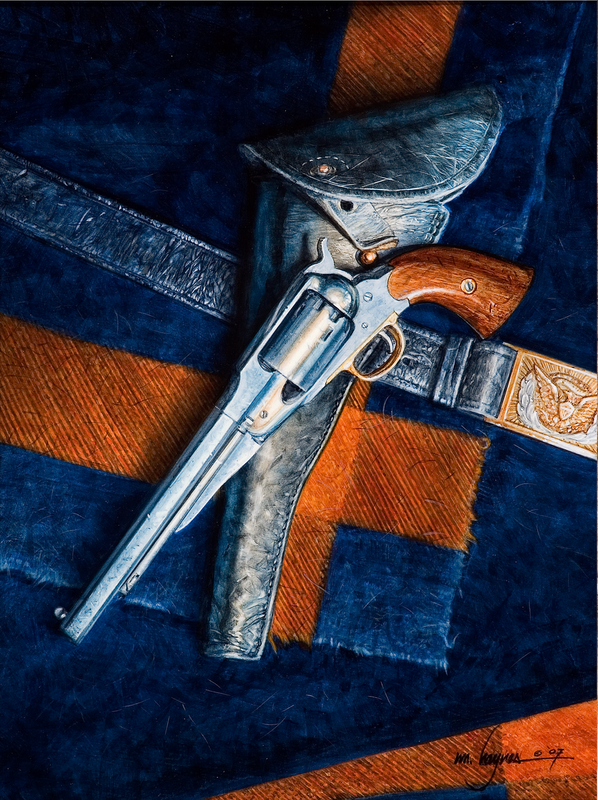 The weapon most commonly used by the Pony Express riders was the 1851 Colt Navy. The revolver, with its beautifully carved Slim Jim style holster is resting on a leather mochilla. These mochillas were made specifically for the Pony Express and had four leather lockable mail pouches sewn onto their surface. The mochilla allowed the mail to be transferred from one horse to another without changing saddles. There are three letters featured in the painting with actual Pony Express cancellation stamps and a US Postal stamp on them. To reduce weight, many riders carried an extra loaded cylinder for their pistol rather than an additional revolver. The .44 caliber Colt Army was one of the sidearms most commonly issued to the cavalry during the Civil War. This particular pistol, with its ivory grips is a civilian model. This was only one of many options offered by Samuel Colt on this popular weapon. The cap and ball revolvers of the day required loose powder and lead balls or prepared cartridges of paper, foil or even animal hide. The ammunition was rammed into each chamber by the loading lever below the barrel. 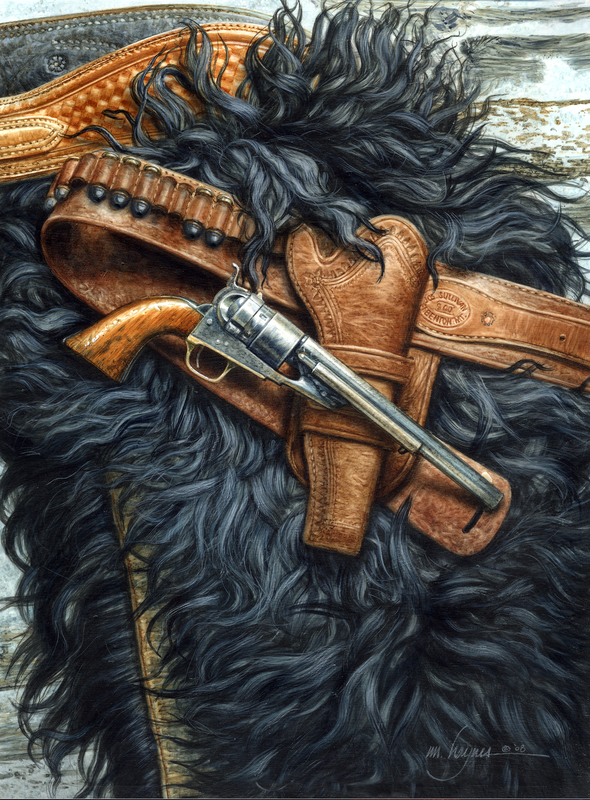 The Colt and its holster are resting on a Navajo style saddle blanket. The 1862 Remington came in two calibers, .36 and .44 and was very popular with U.S. cavalrymen during the Civil War. As well as being a durable, accurate sidearm, the strong frame was believed to hold up better in a hand-to-hand encounter than many of its competitors. 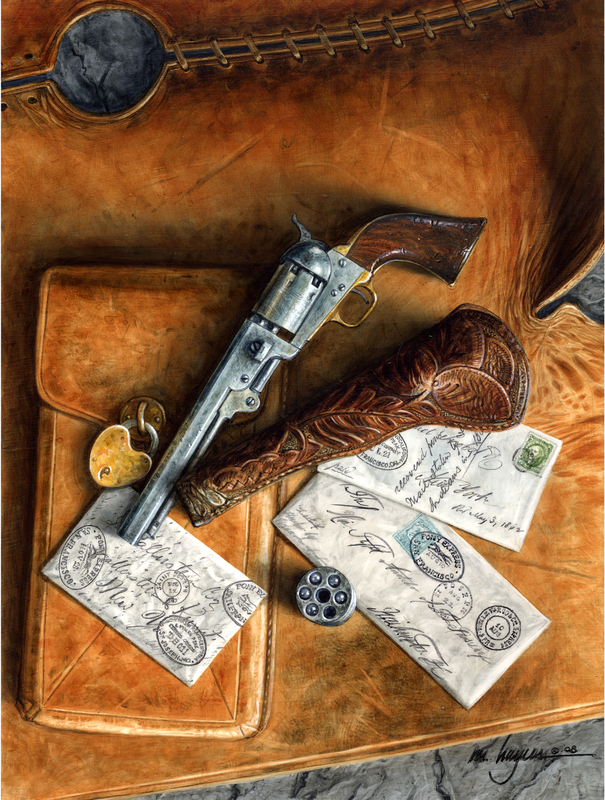 The pistol, with its holster and 1851 dragoon saber belt is resting on a Federal issue 1859 dragoon saddle blanket. These blankets were distinctive with their orange stripes woven into the indigo blue wool.